Android Oreo is the most popular version of Android on Pornhub, according to the streaming website. The five-year-old Android KitKat accounts for more Pornhub traffic than Android Pie. Meanwhile, iOS 12 is easily the most popular version of iOS on the adult streaming website. Pornhub recently posted its year in review, charting the most popular search terms, operating systems and browsers used in 2018. Now, the company has revealed the most popular Android versions used by its viewers in the year that was. Android Oreo was the number one pick for 2018, Pornhub revealed to Android Authority, accounting for 41.28 percent of all Android traffic. The Oreo updates have been available for roughly a year already, making it the first choice for manufacturers at the tail-end of 2017 and for most of 2018. Android Pie is the latest version of Android, however, and it’s nowhere near the top. In fact, it was only in sixth place, racking up 2.78 percent of total Android traffic in 2018. Pie has been out since August, giving manufacturers several months to bring it to their phones. So it’s a real pity to see the new version of Android so far down the list. 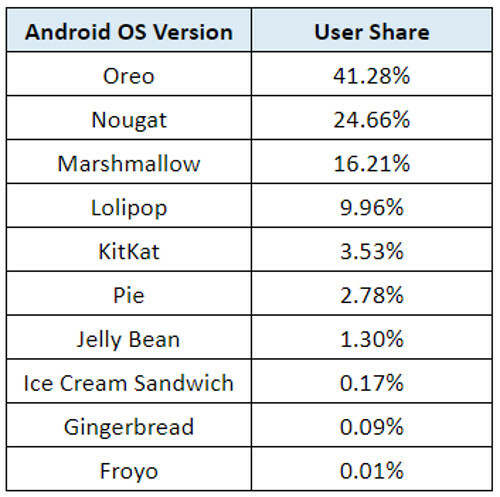 This means that the five-year-old Android KitKat (in fifth place) is more popular than the latest version of Android. Otherwise, we also see Nougat, Marshmallow, and Lollipop in the top five. It’s also interesting to see the likes of Gingerbread and Froyo crack the list, despite being almost ten years old. But these aren’t the oldest versions of Android still popping up in Pornhub’s logs. “We do have a tiny number of daily users on Eclair, Cupcake, Honeycomb, and Donut (0.0001 percent),” the company told us. It’s unclear exactly how this traffic breakdown compares to the Android world at large. Google’s Android version dashboard is out of date, with the last update posted in October. Pie wasn’t on the list back then, but Oreo accounted for just over 31 percent of devices connecting to the Play Store (followed by Nougat at 28.2 percent). The adult streaming website also revealed the most popular versions of iOS used by its viewers in 2018, and it’s no surprise to see iOS 12 top the chart. The new update was only released this year, but already accounts for 73.33 percent of Pornhub traffic in 2018. We see iOS 11 in second place, grabbing roughly 21 percent of the pie. 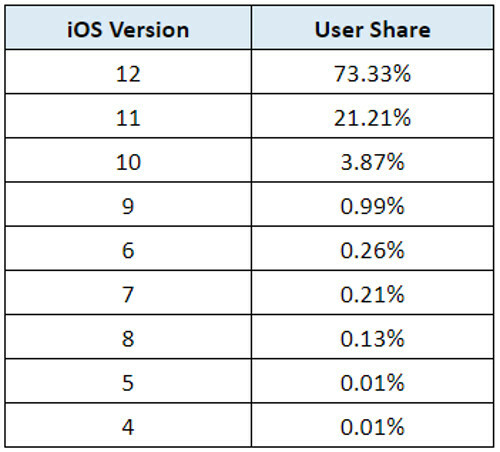 But there’s a sharp drop-off to iOS 10 (3.87 percent), all the way down to 0.01 percent for iOS 4 and iOS 5. This perhaps illustrates Apple’s drive to upgrade as many devices for as long as possible. After all, the 2013-era iPhone 5S has also received iOS 12. “We do have a tiny number of daily users on [iOS] 2 and 3 (0.0003 percent),” the company told us. It’s clear the Android world has a long way to go if it hopes to achieve the same rate of update adoption as Apple’s devices. Google has introduced initiatives like Project Treble, streamlining the Android architecture in order to speed up the update process. But the sheer variety of Android devices and manufacturers, along with the versatility of Android (allowing for skins and extensive customization), makes an Apple-style update process a massive undertaking.